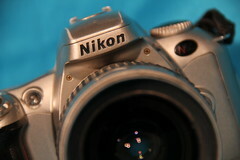 The Nikon F55 (N55 in the US), is an entry level 35mm SLR camera distributed by Nikon. 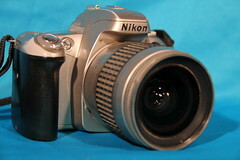 Nikon F55 with a 28-80mm f/3.3-5.6G kit lens. 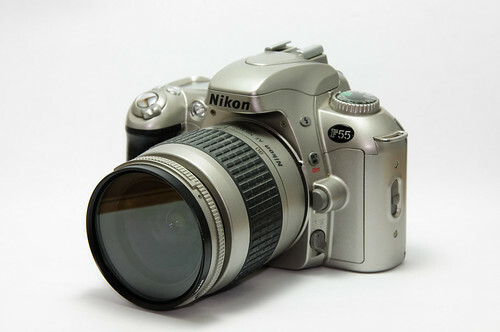 The Nikon F55, sold as the N55 in the United States, is an entry level, extremely light, mostly-plastic autofocus 35mm film SLR, first sold in 2002 and discontinued along with most of Nikon's film cameras in 2006. A time and date imprinting version was also available as the F55D / N55QD. 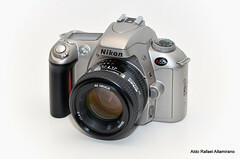 It's much the same as Nikon's other consumer film SLRs from its era, giving the usual P/S/A/M modes. But, several features present on other cheap film SLRs but unlikely to be used by the average consumer were omitted in the F55. 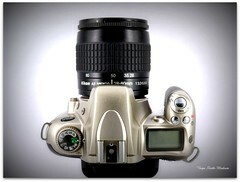 It will only offer full capabilities autofocus and metering with G type lenses without the aperture ring. Screw-type AF lenses either AF or AF-D are also compatible. AF lens without D does not have the more advanced 3D type matrix metering defaulting to the non-3D matrix metering mode. Auto focus will not work with AF-S and AF-I lenses, and vibration reduction doesn't work on the lenses that offer it. It also won't meter with most manual-focus lenses (AI, AI-S and Series E, though it does offer meter with AI-P lenses). This economy made some amount of sense, since the AF-S and VR lenses available in 2002 tended to be big, heavy telephotos that a cheapie camera like the F55 was never going to see. External flashes will not offer TTL flash metering with the F55; the built-in flash, however, does. It has no DOF preview button, and it is impossible to set a film speed manually, as it does not have an ISO button (with non DX-coded film, the ISO will be set to 100); another sensible economising measure for the snapshoot market. Automatic bracketing is limited to three exposures. Unusually, the F55 uses film backwards; it loads the entire roll onto the take-up spool when loading, then winds it back into the canister as the film advances, presumably as a stupid-proofing measure. if the back of the camera is opened, the shots that have already been taken will not be ruined. It counts down the number of shots available. The film loading operation on this is similar to the F75 / N75. Power is supplied by two CR2 batteries. The date back variations of the camera also uses a CR2025 coin type battery. Not compatible with infrared film. This page was last edited on 11 February 2019, at 05:00.